On the fatal fortieth mission of the 449th Bomb group to the Marshaling Yards of Bucharest,Romania Meddie did a replacement on the Thieme Crew. He was reported ‘missing in action' for a year, before being reported as ‘killed in action'. 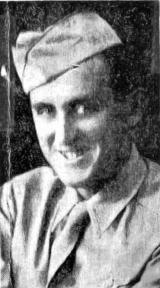 Meddie did not make it to his 22th birthday, July of 1944. He successfully completed thirteen missions against enemy opposition over Germany and German occupied territories. Meddie's mother Agnes Brouillette recieved posthumously the "Airmedal with one oak leave cluster" and the "Purple Heart" awards for his courage. Captain Emile I Hirsch presented the medal to Mrs Brouillette in a chapel Ceremony at Stout Field Indianapolis in 1945. Meddie is buried in the Ardennes American Cemetery at Neuville-en-Condroz, Belgium.